Despite a poor IPO, PHAS's stock price has recently surged. I believe that the price surge is unwarranted by the company's fundamentals and that the stock will retrace to previous price levels. An imminent catalyst to trigger the retrace is PHAS's forthcoming IPO lockup expiry. 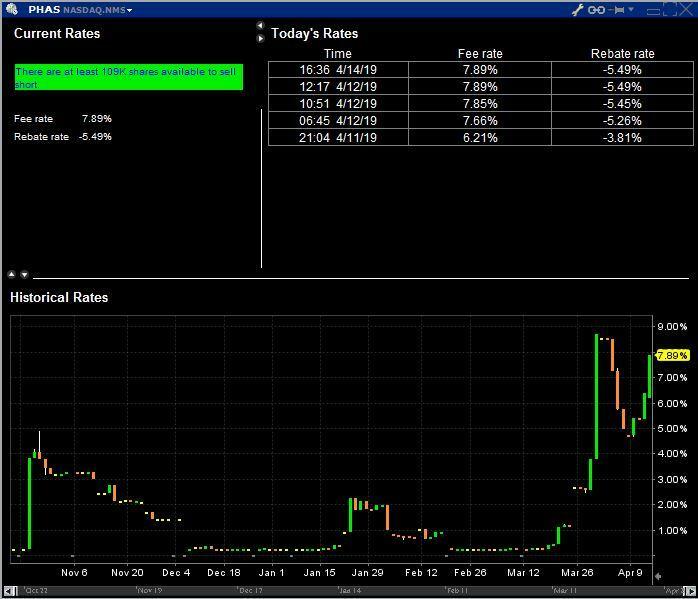 In this article, I explain why I've taken a small short position in PhaseBio Pharmaceuticals (PHAS), but let me say from the outset that I know of no red flags with the company; rather I expect its lead drug candidate to be approved once all trials are complete. Nonetheless, current valuation and a forthcoming catalyst suggest that in a few months the company's stock price will be significantly lower than it is today ($14.66). clinical-stage biopharmaceutical company focused on the development and commercialization of novel therapies to treat orphan diseases, with an initial focus on cardiopulmonary indications. Our lead product candidate, PB2452, is a novel reversal agent for the antiplatelet drug ticagrelor, which we are developing for the treatment of patients on ticagrelor who are experiencing a major bleeding event or those who require urgent surgery. We recently completed a Phase 1 clinical trial of PB2452 in healthy subjects and intend to initiate a Phase 2a clinical trial in healthy older subjects in the first half of 2019. The United States Food and Drug Administration, or FDA, granted breakthrough therapy designation for PB2452 in April 2019" (my emphasis). This slide from the company's investor presentation summarizes the company's pipeline and expected timeline. In this case, I think the easiest way to explain my short position is by referencing the stock price. 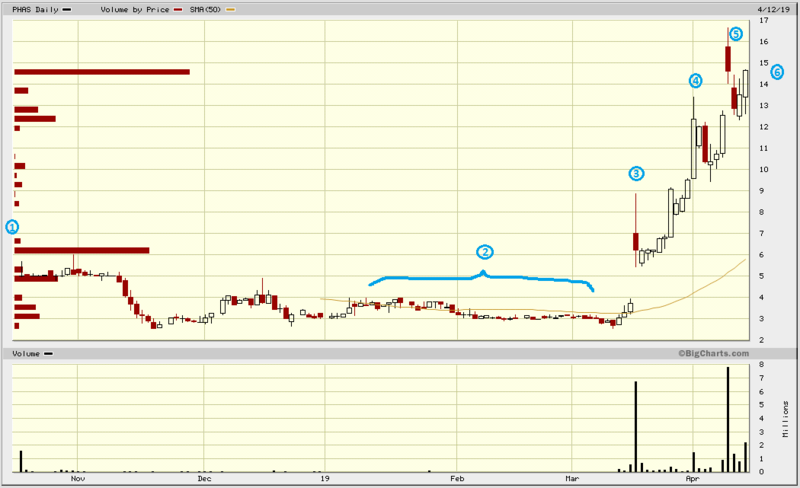 Here's a chart of the price action since the company IPO'd in the fall of last year. The numeric annotations correspond to my discussion points below. As can be seen, the stock price has undergone a threefold increase since its IPO and a greater than fourfold increase since its post IPO trading which saw the stock level off at about $3 per share. The sudden price increase is, in my opinion, overdone and I expect the stock to retrace some or most of the upward spike in the near future. I explain my rationale below with references to the chart annotations. As part of the IPO process, on October 6th PHAS filed a prospectus with the SEC, indicating an expected pricing of $12-$14 per share with 5M shares being sold. Two weeks later, presumably due to tepid investor interest, the company was forced to cut its expected share price down by more than half and up the number of shares issued significantly. Ultimately the company issued 9.2M shares at $5! It's never a good sign when an IPO has to be drastically down-priced and this was no exception, as we see from the next point. The single biggest factor, in my opinion, is the limited market opportunity for PB2452. Recall from the highlighted portion in the opening description that PB2452 is to be used for a very specific indication, viz. for ticagrelor patients who either experience a major bleeding event or who need to have urgent surgery. (Patients on ticagrelor whose surgeries are scheduled are taken off of ticagrelor five days prior to surgery, so there's no need for PB2452 in those circumstances.) Note also that both these use cases are one-off events, thus the very limited number of potential users won't be recurring patients, they'll only be given the drug when the triggering event is operative. The limited market opportunity is corroborated by the low price for which PHAS obtained rights to the drug. In November 2017, we entered into an exclusive license agreement with MedImmune Limited, a wholly owned subsidiary of AstraZeneca plc, or the MedImmune License. Pursuant to the MedImmune License, MedImmune granted us an exclusive, worldwide license under certain patent rights owned or controlled by MedImmune to develop and commercialize any products covered by the MedImmune License, or the MedImmune licensed products, for the treatment, palliation, diagnosis or prevention of any human disorder or condition. Under the MedImmune License, we paid MedImmune an upfront fee of $0.1 million. We are also required to pay MedImmune: quarterly fees relating to technical services provided by MedImmune; up to $18.0 million in clinical and regulatory milestone fees; up to $50.0 million in commercial milestone fees; and mid-single digit to low-teen royalty percentages on net sales of MedImmune licensed products, subject to reduction in specified circumstances. In addition, the MedImmune License offers an option for third party product storage costs. As of June 30, 2018, we have paid $0.6 million under the MedImmune License, including $0.5 million in third party storage costs. Importantly, ticagrelor (brand names Brilinta, Brilique, and Possia) is made and marketed by AstraZeneca (AZN), so who could know more about the market opportunity for PB2452 than MedImmune/AZN? Yet these entities sold the rights to the drug for $100,000 and some possible milestone payments! 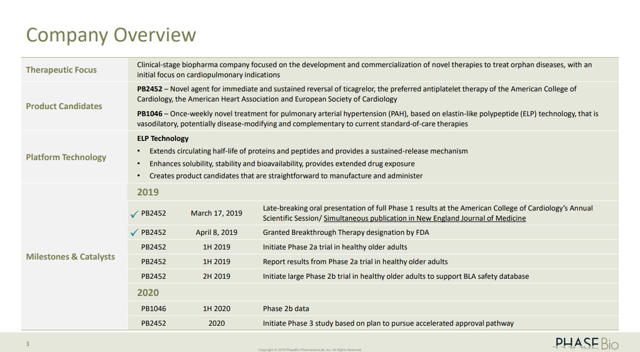 On March 18, 2019, PHAS announced excellent phase 1 data for PB2452, which sent the stock on a long upward trajectory. See this SA news summary for more info. As I said from the outset, I expect that PB2452 will be approved and it will be used in the very limited number of cases where it's necessary. However, this doesn't change the limited market opportunity discussed above (including AZN's choice to sell the drug off for a song). Moreover, with a limited market size, the costs for selling the drug may represent a much higher proportion of sales that would be the case for a high revenue product. As a sign that PHAS also considers the recent stock price surge as unjustified, note that despite having just done an IPO, the company did two additional financings in quick succession. On March 25, it did a $15M debt financing (and was silent on the interest rate which is typically not a positive sign that the company got good terms). Then, on April 9, the company filed a prospectus to sell another 3M shares, which were subsequently priced at $12 per share. 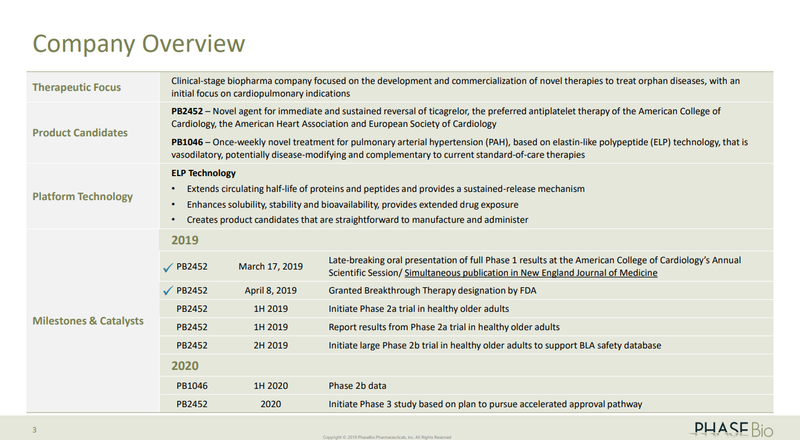 The April 9 filing fell on the heels of the company announcing receipt of Breakthrough Therapy designation for PB2452. Again, I don't think approval is in question, so this isn't much of an incremental gain, and it certainly doesn't obviate the concern about the drug's very limited market. But the company saw an opportunistic time to raise more money and it expeditiously did so. As I've argued above, I believe that the recent stock price surge is unjustified based on the PB2452's limited market opportunity and low acquisition price. My belief is further corroborated by PHAS' own rush to issue more shares and debt at current market prices. I think that the lockup expiry will coincide with the start of downward move in the stock price. This is particularly true because the failed (down priced) IPO probably scared some holders who, if they were debating on selling their shares, will now be ecstatic with the current stock price. For the reasons given above, I'm short a small position in PHAS. Ultimately I wouldn't be surprised to see a full retrace of the recent price surge, but currently, I'm only planning to trade it down to the $8 to $10 level. At this point in time, the cost to short PHAS is reasonable, but I will revisit the trade if the cost goes up substantially. 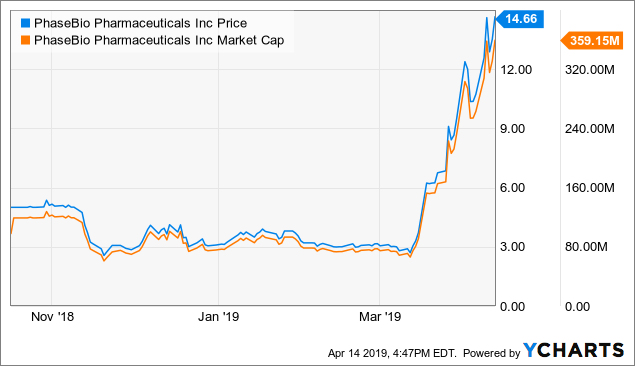 A version of this article was previously released to subscribers of Total Pharma Tracker, a Marketplace service with whom I am now collaborating. Some of my work will be available to TPT subscribers either exclusively, or in advance. Disclosure: I am/we are short PHAS. I wrote this article myself, and it expresses my own opinions. I am not receiving compensation for it (other than from Seeking Alpha). I have no business relationship with any company whose stock is mentioned in this article. Additional disclosure: I actively trade around core positions.